2013 ITALIA REPUBBLICA - 0,70 Posta Ordinaria (Cat. Unificato. 3435 - Yvert. 3353) tessera filatelica. 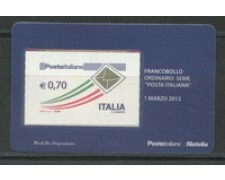 2013 ITALIAN REPUBLIC - 0,70 Ordinary Mail (Cat. Unified. 3435 - Yvert. 3353) philatelic card. 2013 ITALIA REPUBBLICA - 0,25 Posta Ordinaria (Cat. Unificato. 3432 - Yvert. 3350) tessera filatelica. 2013 ITALIAN REPUBLIC - 0,25 Ordinary Mail (Cat. Unified. 3432 - Yvert. 3350) philatelic card. 2013 ITALIA REPUBBLICA - Natale (cat. Unificato. 3493/3494 - Yvert. 3411/3412) serie completa 2 tessere filateliche. 2013 ITALIAN REPUBLIC - Christmas (cat. Unified. 3493/3494 - Yvert. 3411/3412) complete series 2 philatelic cards. 2013 ITALIA REPUBBLICA - Serie Turistica "Ponza - San Leo - Scanno - Tropea " (Cat. Unificato. 3499-3502 - Yvert. 3416/3419) serie completa 4 tessere filateliche. 2013 ITALIAN REPUBLIC - Tourist Series "Ponza - Ban Leo - Scanno - Tropea" (Cat. Unified. 3499-3502 - Yvert. 3416/3419) complete series 4 philatelic cards. 2013 ITALIA REPUBBLICA - 90° Anniversario dell'Aeronautica Militare (Cat. Unificato. 3439 - Yvert.3357) tessera filatelica. 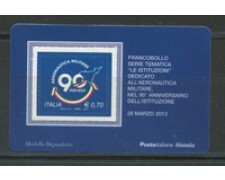 2013 ITALIAN REPUBLIC - 90th Anniversary of the Air Force (Cat. Unified. 3439 - Yvert.3357) philatelic card. 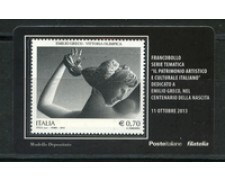 2013 ITALIA REPUBBLICA - Centenario della nascita di Emilio Greco scultore (Cat. Unificato. 3470 - Yvert. 3388) tessera filatelica. 2013 ITALIAN REPUBLIC - Centenary of the birth of Emilio Greco sculptor (Cat. Unified. 3470 - Yvert. 3388) philatelic card. 2013 ITALIA REPUBBLICA - Questure d'Italia (Cat. Unificato. 3449 - Yvert. 3367) tessera filatelica. 2013 ITALIAN REPUBLIC - Police Headquarters of Italy (Cat. Unified. 3449 - Yvert. 3367) philatelic card. 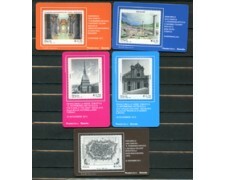 2013 - LOTTO/22818 - REPUBBLICA - PATRIMONIO ARTISTICO - 5 TESSERE FIL. 2013 ITALIA REPUBLICA - Patrimonio artistico e culturale Italiano (Cat. Unificato.3506/3510 - Yvert. 3424/3428) serie completa 5 tessere filateliche. 2013 ITALIAN REPUBLIC - Artistic and cultural heritage Italian (Cat. Unificato.3506 / 3510 - Yvert. 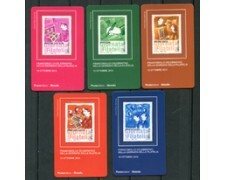 3424/3428) Complete Series 5 philatelic cards. 2013 ITALIA REPUBBLICA - 150° Anniversario della nascita di Gabriele D'Annunzio poeta (Cat. Unificato.3437 - Yvert. 3355) tessera filatelica. 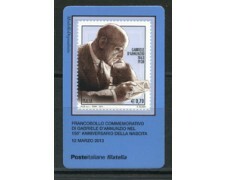 2013 ITALIAN REPUBLIC - 150th Anniversary of the birth of poet Gabriele D'Annunzio (Cat. Unificato.3437 - Yvert. 3355) philatelic card. 2013 ITALIA REPUBBLICA - Campionati del mondo di sci nordico Val di Fiemme (Cat. Unificato.3430 - Yvert. 3348) tessera filatelica. 2013 ITALIAN REPUBLIC - Championships in Val di Fiemme Nordic skiing world (Cat. Unificato.3430 - Yvert. 3348) philatelic card. 2012 - LOTTO/22811 - REPUBBLICA - OSSERVATORI ASTRONOMICI - 2 TESSERE FIL. 2012 ITALIA REPUBBLICA - Francobolli celebrativi dell'Osservatorio astronomico di Brera e Capodimonte Napoli (Cat. Unificato. 3419/3420 - Yvert. 3336/3337) serie completa 2 tessere filateliche. 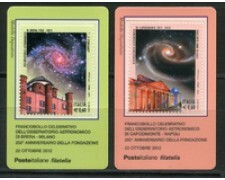 2012 ITALIAN REPUBLIC - commemorative stamps of the Astronomical Observatory of Brera and Capodimonte Napoli (Cat. Unified. 3419/3420 - Yvert. 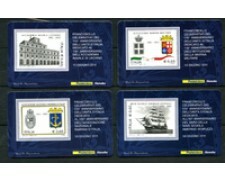 3336/3337) complete series 2 philatelic cards. 2012 ITALIA REPUBBLICA - Giornata della Filatelia (Ct. Unificato. 3404/3408 - Yvert.3322/3326) serie completa 5 tessere filateliche. 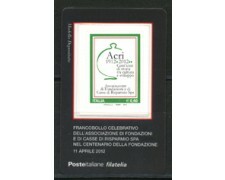 2012 ITALIAN REPUBLIC - Day of Philately (Ct. Unified. 3404/3408 - Yvert.3322 / 3326) Complete Series 5 philatelic cards. 2012 ITALIA REPUBBLICA - Cinquantenario della fondazione dell'Ente Nazionale per l'Energia Elettrica " Enel" (Cat. Unificato. 3423 - Yvert. 3341) tessera filatelica. 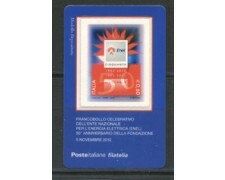 2012 ITALIAN REPUBLIC - Fiftieth anniversary of the foundation of National Body for Electrical Energy "Enel" (Cat. Unified. 3423 - Yvert. 3341) philatelic card. 2012 ITALIA REPUBBLICA - La brigata paracadutisti " Folgore" nel 70à anniversario della battaglia di El Alamein (Cat. Unificato.3421 - Yvert.3339) tessera filatelica. 2012 ITALIAN REPUBLIC - The Paratroopers Brigade "Thunderbolt" in the 70th anniversary of the Battle of El Alamein (Cat. 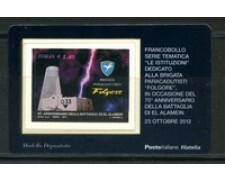 Unificato.3421 - Yvert.3339) philatelic card. 2012 ITALIA REPUBBLICA - Centenario della fondazione del Corpo Nazionale dei Giovani Esploratori (Cat. Unificato. 3403 - Yvert. 3321) tessera filatelica. 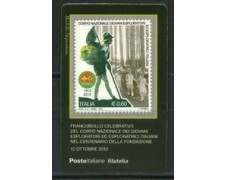 2012 ITALIAN REPUBLIC - Centenary of the foundation of the National Youth Corps Explorers (Cat. Unified. 3403 - Yvert. 3321) philatelic card. 2012 ITALIA REPUBBLICA - 4° Centenario dell'officina farmaceutica Santa Maria Novella (Cat. Unificato.3381 - Yvert. 3299) tessera filatelica. 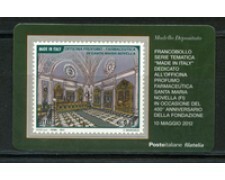 2012 ITALIAN REPUBLIC - 4th Centenary workshop pharmaceutical Santa Maria Novella (Cat. Unificato.3381 - Yvert. 3299) philatelic card. 2012 ITALIA REPUBBLICA - Abbatimento bariere architettoniche (Cat. Unificato.3424 - Yvert. 3342) tessera filatelica. 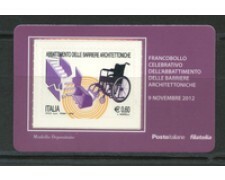 2012 ITALIAN REPUBLIC - Elimination of architectural barriers (Cat. Unificato.3424 - Yvert. 3342) philatelic card. 2012 ITALIA REPUBBLICA - Centenario fondazione Casse di Risparmio " Acri" (Cat. Unificato. 3367 - Yvert. 3285) tessera filatelica. 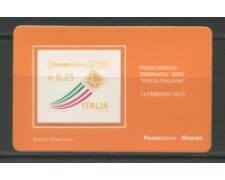 2012 ITALIAN REPUBLIC - Centenary Foundation of Savings Banks "Acre" (Cat. Unified. 3367 - Yvert. 3285) philatelic card. 2012 ITALIA REPUBBLICA - 150° Anniversario della Corte dei Conti (Cat. Unificato. 3400 - Yvert. 3318) tessera filatelica. 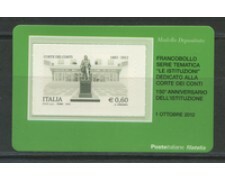 2012 ITALIAN REPUBLIC - 150th Anniversary of the Court of Accounts (Cat. Unified. 3400 - Yvert. 3318) philatelic card. 2011 ITALIA REPUBBLICA - 150° Anniversario dell'Istituzione della Marina Militare (Cat. Unificato. 3299/3302 - Yvert. 3217/3220) serie completa 4 tessere filateliche. 2011 ITALIAN REPUBLIC - 150th Anniversary of the Institution of the Navy (Cat. Unified. 3299/3302 - Yvert. 3217/3220) complete series 4 philatelic cards.